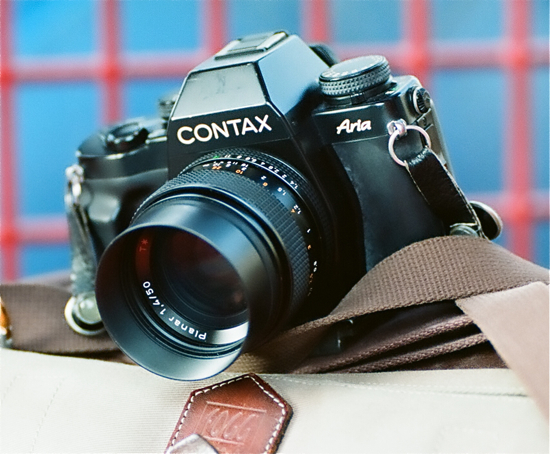 Probably the most reliable Contax body built, Aria is the last Contax film camera body with all the latest features. I believe Aria was designed with the intention to build a body that is light weight and small in size but not compromising performance. Within a very small package using more advance non-metallic material, the Aria houses 3 metering modes (including spot metering and the first time in Contax matrix metering), preview button, 3 frame-per-second shooting mode, double exposure, Contax latest 5-pin TTL flash metering contacts, using 2 CR2 batteries, the same usual large and bright pentaprism, and the ability to record photographic details on the first 2 frames of the film with the very expensive add-on D-9 data back. Back view of Aria, with sophisticated D-9 data back. I do have a few complaints about the Aria though. Firstly, it seems ‘slow’, although technically at 3 frame-per-second it is definitely fast enough, but somehow it gives me a shutter lag feel. Being light weight, it is a sweet body for travel but the balancing becomes not so ideal with heavier Zeiss lenses. As for the view finder LCD display, Aria has adopted the latest layout by all major film and digital camera makers, but personally I would prefer the older shutter speed layout but guess that is not the current trend anymore. Top shutter speed is a respectable 1/4000, but the flash sync speed is conventional at 1/125. Top shutter speed 1/4000, 5-pin flash TTL contact. 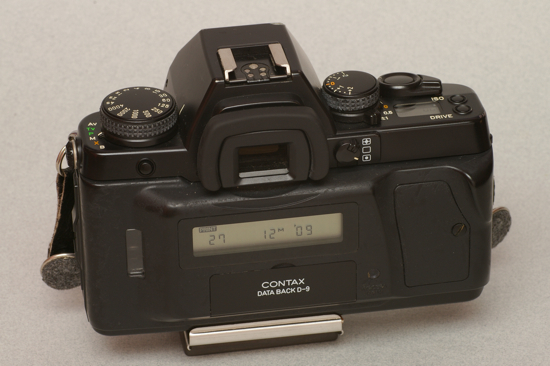 With the 5-pin TTL flash contacts the dedicated flash can now transfer aperture settings to the body, but not the zoom settings. 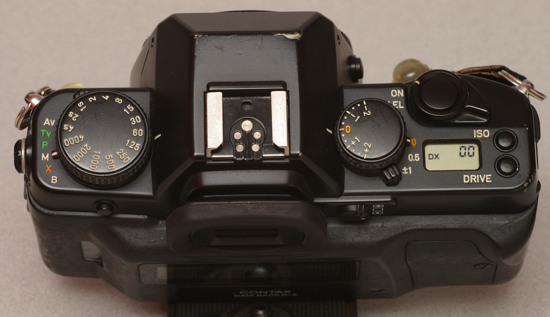 3 metering modes: matrix (top), centre average and spot (bottom). Aria is a nice and sweet camera. It cannot go very wrong for ladies, and for travel photographers. It will form a very light weight and high image quality package with the Zeiss 28-70 / 3.5-4.5 Vario Sonnar T* zoom lenses, which is also very light and small, and a lens of very high image quality.